Henry Inman was the leading portrait painter in New York City from the 1820s until his death. As a friend of such literary figures as James Fenimore Cooper and a founding member of the National Academy of Design, the most important mid-century artistic organization in the country, he played a significant part in the intellectual life of the city. In addition to portraits, Inman also painted idyllic landscapes, literary subjects, and genre scenes. In “Dismissal of School on an October Afternoon,” his last painting and largest genre canvas, Inman depicted all the buoyant energy and gaiety of children just released from their classroom on a beautiful autumn afternoon. Watched by a grinning African American workman, girls play with a doll, a boy sails a boat in a stream, and two youths read an adventure story with great interest. A still life of hats and lunch pails, discarded so the children can play, occupies the foreground. In the background, a scrawny schoolmaster locks the door of the one-room country schoolhouse with “I. Crane” inscribed over the door. Contemporary viewers would have understood this reference to Ichabod Crane, a character in Washington Irving’s “Legend of Sleepy Hollow,” a humorous tale about a country school teacher. 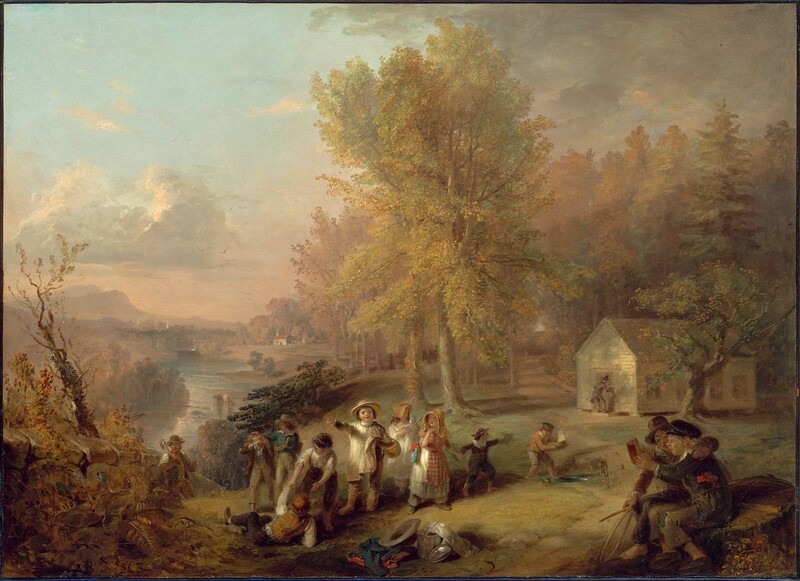 The children frolic in a romantic landscape that is not a specific site but is characteristic of the Hudson River valley, the scene of Washington Irving’s story. 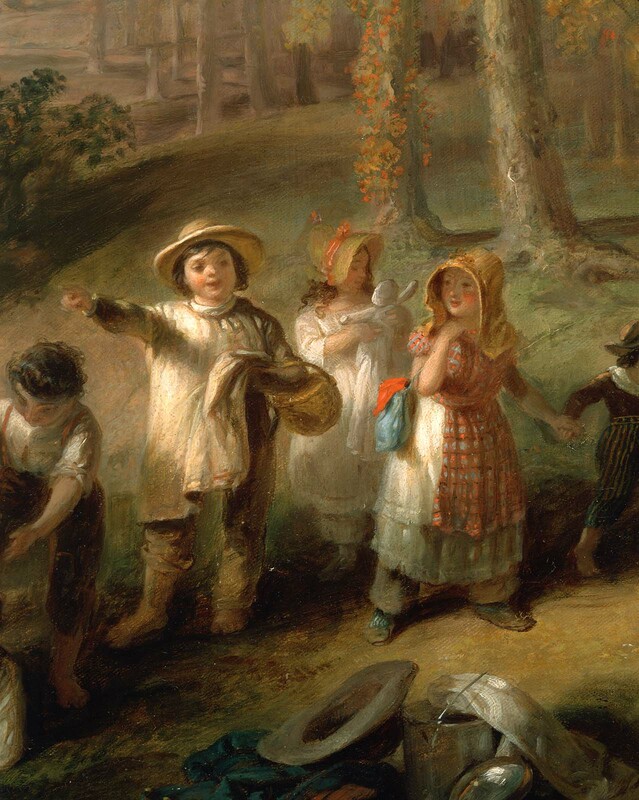 Inman painted other genre scenes of children playing in rural settings, including one of a barefoot young fisherman and another of two boys playing a game called “mumble the peg” after school. He also depicted a ragged newsboy in an urban setting. Thus, as early as 1830, Inman contrasted the wholesomeness of the rural childhood with the evils of urban street life in his paintings. 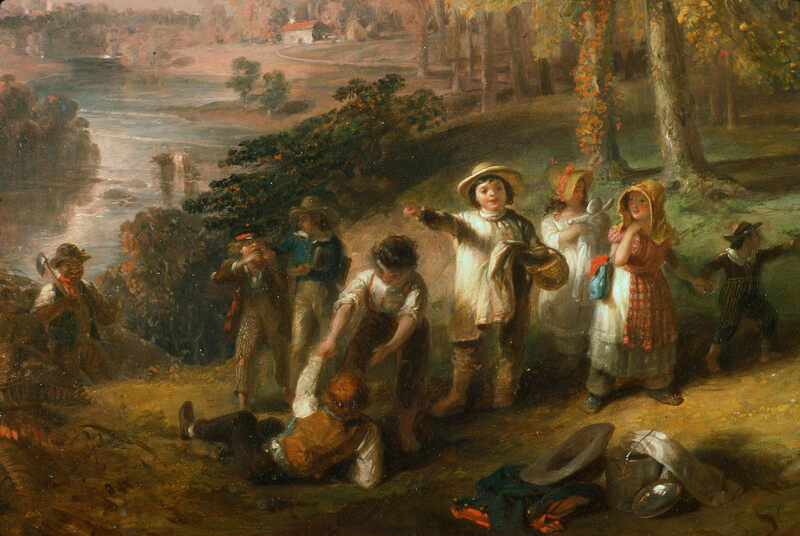 “Dismissal of School on an October Afternoon” was not only the capstone of Inman’s career but also provides an idealized view of childhood in America in the mid-1840s. During the administration of President Jimmy Carter, this appealing painting was loaned to the White House, where it was hung in his daughter Amy’s bedroom. Lower left, on rock: Inman./1845. The artist; William P. Jones, 1846; James Lenox, New York; to Lenox Library, 1870; to Lenox Foundation, New York Public Library, 1895; sold Parke-Bernet Galleries, New York, April 14-16, no. 192, 1943; with Victor Spark, New York, 1943;to Maxim Karolik, Newport, R.I., 1943l; to MFA, 1948, gift of Martha C.(Mrs. Maxim) Karolik.